Based on the early-nineteenth-century poem by Alfred, Lord Tennyson, Trego’s painting joins a dozen or so other works inspired by the same verses in the late nineteenth and early twentieth centuries. 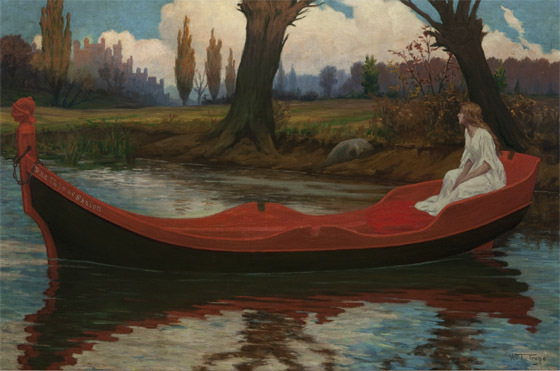 With her name—and therefore the title of the painting—written on the boat as described in the poem, the lady looks longingly at Camelot as she floats downstream toward the castle. There are no oars in the oarlocks, and she cannot control the boat any more than she can control her destiny. The victim of a mysterious curse, she will be dead before the boat reaches Camelot. The background, with mellow late-afternoon light falling on the distant towers and trees, is reminiscent of some paintings by Maxfield Parrish and quite different from “the low sky raining” actually described by Tennyson. Obtained from the artist by a member of his cousin Howard Trego’s family and passed down through the family to the current owner.